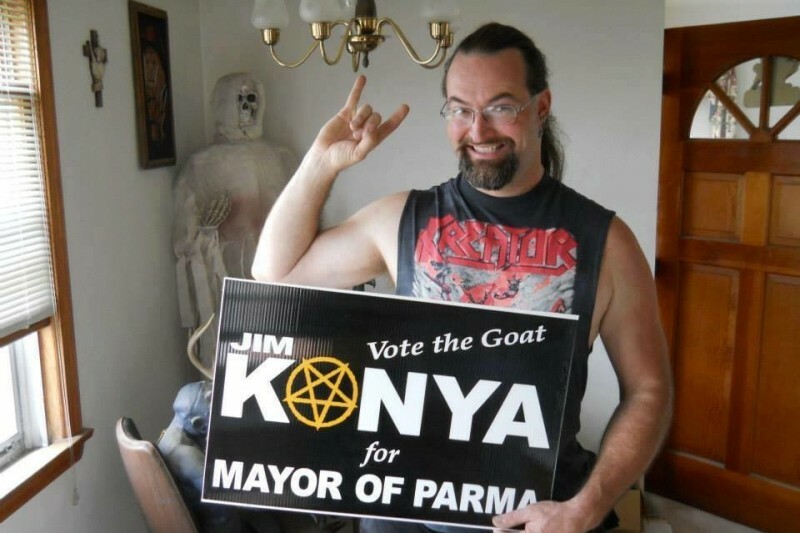 Recently, the MAYOR OF PARMA and Cleveland metal legend JIM KONYA (Nunslaughter, Schnauzer, + many more) suffered a stroke. At one time or another Jim has likely given us all a CD, record, sticker, shirt... something. Now it's time for us to give back! Let's help Jim get back on his feet and behind a drumset. 100% of funds raised will help Jim pay for medical expenses that insurance may not cover, and other bills incurred during his recovery. PS- follow Nunslaughter on Facebook for updates on his recovery. Jim's Obituary can be found at the link below. A Mass of Christian Burial will be held Saturday, October 10, at 11:30 AM at Holy Family Church, 7367 York Rd., Parma. All are welcome to attend. The family will not be holding a viewing, but a celebration of Jim's life is being planned for the future, details TBA. 10/07/15 at 7:10pm, Jim has passed. Please keep him and the Konya family in your hearts. Get better soon dude! You've done so much for this town 's metal scene over the years and I know you've always been a big supporter of WCSB, donating to our radio thon and giving us CDs and tapes of bands for us to add to our music library. You calling me during my radio show on an almost weekly basis to keep me up to date with shows being booked and making great requests means a lot to me, and I can't imagine you not being able to continue being a part of our metal scene! Jim Lasagna! You are one of the most gregarious, hilarious, generous metalheads ever, get well soon, you rusty blade! Our deepest condolences to the Konya family. Hey Jimmy! Get well Soon Buddy! Get better Jim. All I see is Jim walking down Normandy hallway with his briefcase. I recently would pass Jim on the road as he was driving by me and I would have a great big smile on my face as I always remember laughing at him even if he wasn't saying a thing. Funny man - get better to get us laughing again soon. Wishing you the best dude, hope people can contribute... cheers! Hoping you have a speedy recovery. I know you're a fighter. One of the funniest people I've ever met in my life & an unforgettable friend. I'm sorry to hear about this. I hope you get better soon James P Mozzarella! Get better soon ! !praying for a quick recovery! Miss the trash talking we used to do at Dennys !! Konya dammit! Get well A.S.A.P.! This freakette remembers so many good times with you. Especially going to see Ratt together. You saved me from being electrocuted when my basement flooded! Im going to have you over and we'll order some napoleon's pizza when you get out. Much love to you and as you can see a ton of people are pulling for your recovery. Mom says hi too, she wants to see you soon. Get well^^ I wish you strenght and a bunch of good friends! Just a little help to honour one of the best metalhead ever existed. One day we will meet again on the other side Jim!